What a great day was had! 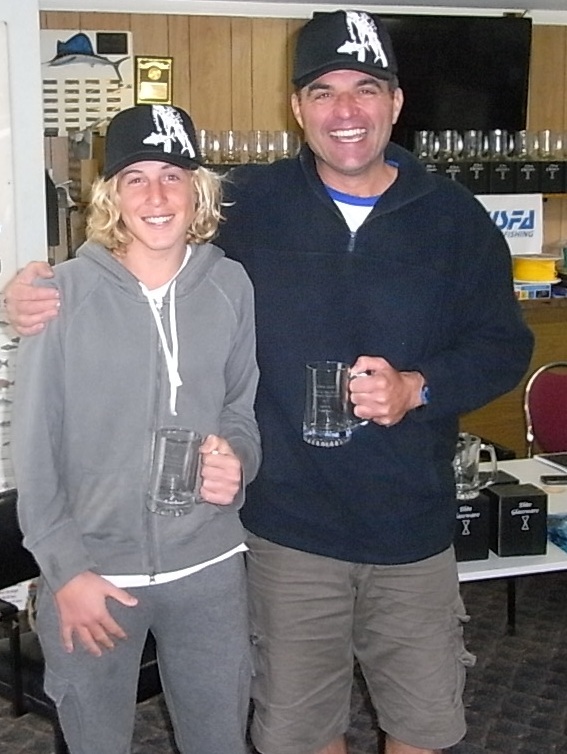 Twenty eight divers, of all ages, and locations along the coast rocked up to the Dolphin’s club house to sign on for the first USFA One Up One Down Pairs meet. No one left disappointed, the diving saw to that, yet even before a fin was dipped in the water spearos were showing obvious signs of stoke. Passing over their fifteen bucks to register for the event and being handed a trucker cap, T -shirt and Stubby cooler all embossed with great sponsor Adreno’s logo on them, spearos were incredulously asking “…What, we are given these, and we get a beer and are fed for fifteen bucks?!? Awesome! !” Hell yeah! “Awesome” continued to be the exclamation of the day after everyone came back to the club house after the dive. More on that soon. What inspired me to run this event goes back about 15 years ago. 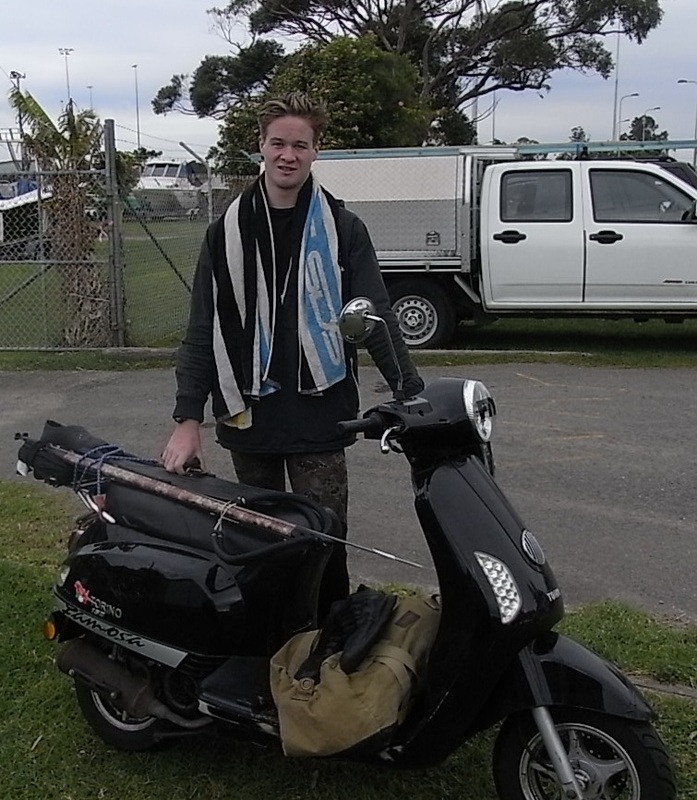 I travelled across the ditch to NZ with old friend Lenny “Froggo” Goldsmith to compete as a team in their National Spearfishing Tournament. The Kiwis fantastic hospitality and kindness ensured I have fond memories forever of my stay there and I walked away from this fantastic week converted to their style of meet as the Pairs format they used in their national tournament combined with the fact that the whole week was really a sea side holiday for all their families that sold it to me. The event catered for the children and partners of the divers with different events leading up to the two days of Open event spearfishing. Keen divers were happy to give up a day to swim around and pair up with the young spearos, and women to decide the juniors and ladies events. By “pair up” I mean that during the event they practise diving together where the senior diver remains on the surface while always watching out for the younger diver below who spears the fish. An experienced, relaxed mentor is able to guide the younger diver through the day with diving tips and strategy that would normally take months if not years to learn. When you see the amount of talented young kiwis coming on in the international scene you know the system is a winner and really it should be endorsed over here. The Open event too is Pairs diving, how do they do manage to do this? Two divers, two guns, two rig cords – one a standard length to one of their guns, the other a 4m rig line (often bungee) attached to the other gun both of these rig lines are connected to the one plat (boat type float that has a hatch enabling to keep fish enclosed inside the float) and once again there is one diver on the surface while one diver is diving below, the ‘pair ‘can dive alternately or have strategy where one diver may do several consecutive dives before swapping the long rig for the short. Kiwis have followed this pairs format of competition diving since the mid 70’s to minimise harm to the diver spearfishing in these big events where the individual spearo may push themselves harder than usual and as I understand there were some unfortunate tragedies in these competitions. To my knowledge there has not been a fatality in their National meet since the inception of the pair’s format. (Inter Pacific events – that see several island pacific nations pit their spearfishing skills against each other also practise Pairs). When Froggo and I returned we pretty much developed a pairs competition immediately for our club the Sans Souci Dolphins and held several events. The following year we won the Alliman Shield. No mean feat considering we were generally the wooden spooners at that time. Our newer and less experienced divers who dived in these pair's events just improved their diving ability and fishing skills out of sight and this carried on through the club for many years. The intention of the One Up One Down meet was to be about raising safety awareness and improving the skill sets of the divers who came along. I had encouraged a few of the young up and comers in Sydney, the Gong and the Bay area who get on fb to come along and experience this type of spearfishing and it was good to see guys from these areas come along, the Central Coast Sea Lions arrived in good numbers and there amongst them was all round top bloke Alby Cooke and current Club Sea Lions Champ Hayden Montgomery, who would be all of 16 years of age. Many independent (non club) spearos registered. 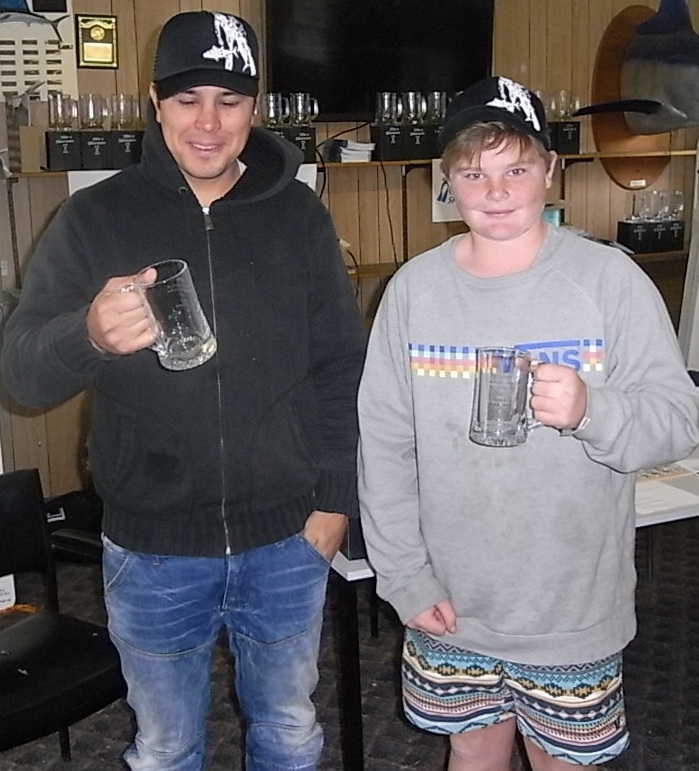 All the guys were blown away by the support from Adreno Spearfishing who donated trucker caps, T-shirts and beer coolers as well as their great Adreno wetsuits for junior and ladies prizes. Now the hardest part of the whole meet was organising the pairs as divers were told that finding a suitable diving partner beforehand was not necessary as a buddy would selected for you. We were blessed to have an even number of 28, and the right mix of experienced hands to newish/younger spearos and after moving name tags up and down the board and pairing up the divers I was satisfied that it was ‘right’, and just when the pairs were being announced to the waiting divers, in walked no 29, a kiwi to boot, Adam O’Neil. A quick reshuffle that saw a group named the Pat Mullins Trio and the divers were away and fishing. As the registration area was at the club house some 5 minutes’ drive from the water I had asked the divers not to enter the water for 30 minutes after the start (0830) and to exit the water by 1230 to be back by 1300 approximately (this would slow down the car driving) the allocated fishing area was to be between South Maroubra and Long Bay, and our safety boats were easily able to monitor the progress of the divers. With a restricted score sheet it did not surprise me of the boaties updates that the fish were hard to come by, however we were short four pairs back at the clubhouse. I’m thinking how keen are these guys to still be in the water. This was not entirely the case… I receive a call from Az Puckeridge and I quickly picked up fearing bad news only to be put onto a wailing Scuba Pete, I had heard from a chuckling Roso that Scuba had slipped in his yellow crocs down Dead Man’s Gulch so I was presuming he was in pain, yet it was not pain but just plain embarrassment. His lift had taken off without him, ha-ha, leaving he and his partner, Steve Montgomery stranded on the beach at Malabar for 40 minutes in a chilly westerly wind. Transport was arranged hastily for pick up. Derrick Cruz and Hayden were also stranded down there as they were kept waiting for the only late comers the Super Yank Leeson and his dive buddy Mulloway virgin Andre Fermanov to take them home. The sad news here was they had the fish to take out this inaugural event. 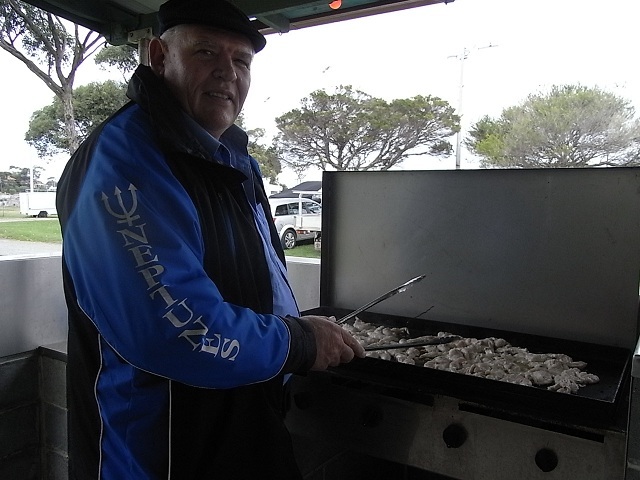 The barbie was on and Ali Sayed of the famous Summerland Restaurant at Bankstown had prepared a mighty feast for the cold and hungry spearos, the food was devoured. The weigh in was a quick affair, there was a very restricted scoresheet (including no red mowies!) 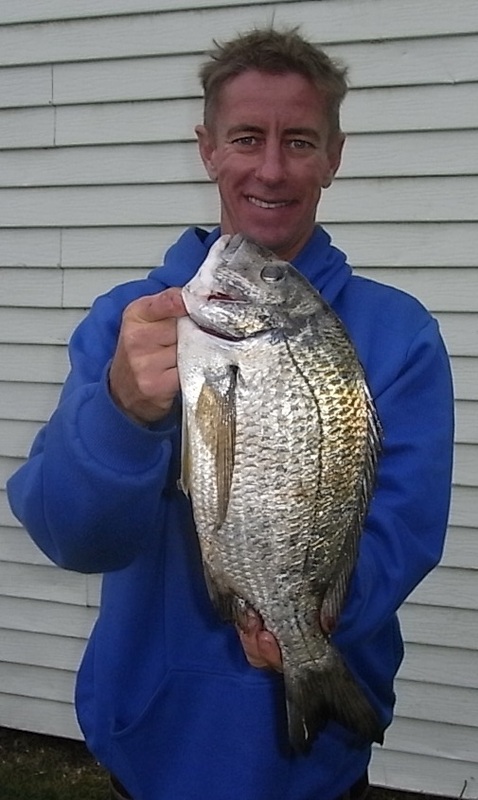 and scoring of 100 points a fish and 10 points a kilo, and in next to no time we had the results. Some very happy divers were surprised they collected some great prizes. 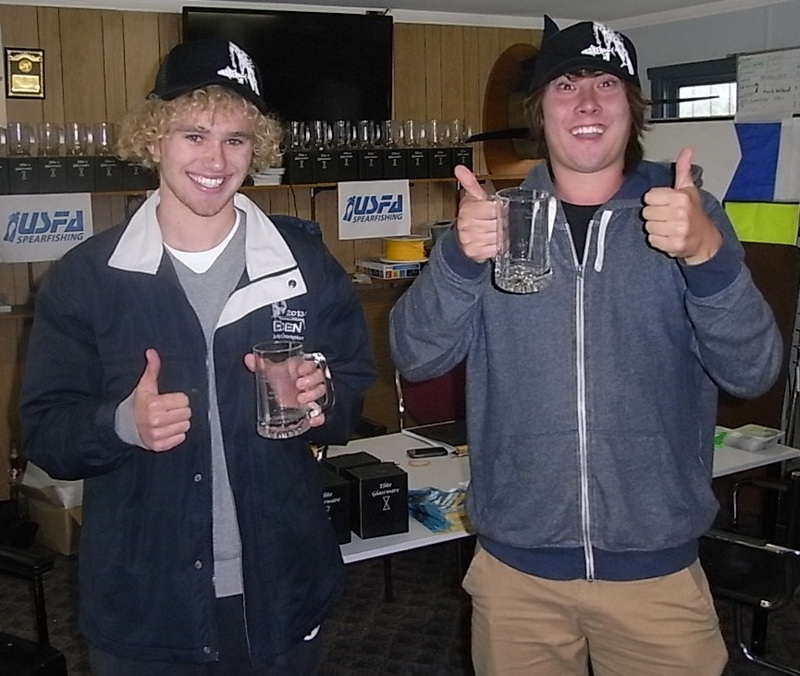 The winners and placegetters collected inscribed glass tankards. 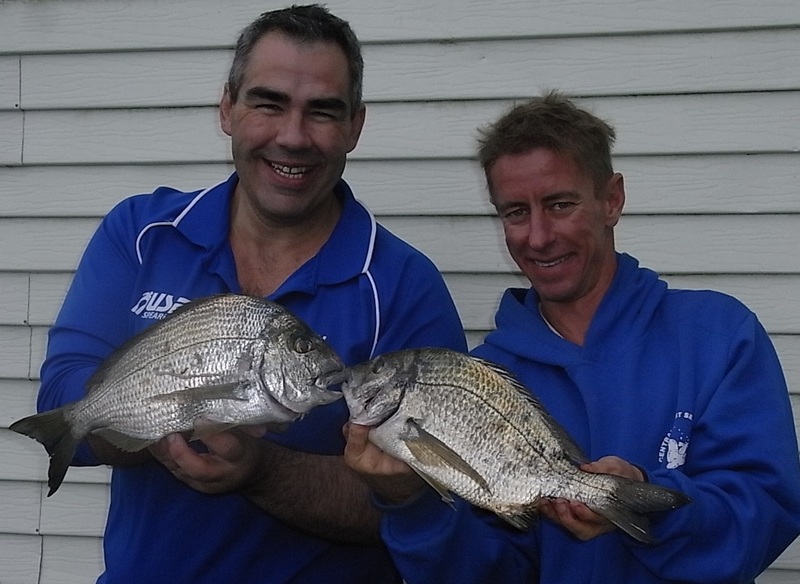 Derrick and Hayden did this with 8 species, only 80grams of fish behind were Aaron and Northern Beaches whiz Peter Kemp, coming in next were a great partnership - the old man of the sea, Australian Champion Paul Roso and that effervescent member of the Green spearfishing family, Lachy. My dear old friend and loyal Dolphin member Emanuel Bova kindly donated a couple of fantastic prizes, one of his Manny Sub roller head kits, as well as a day out on his excellent Down Under Spearfishing Charters ” RIB both great prizes. Two Sea Lions Steve Montgomery and David Thompson were the lucky recipients here. 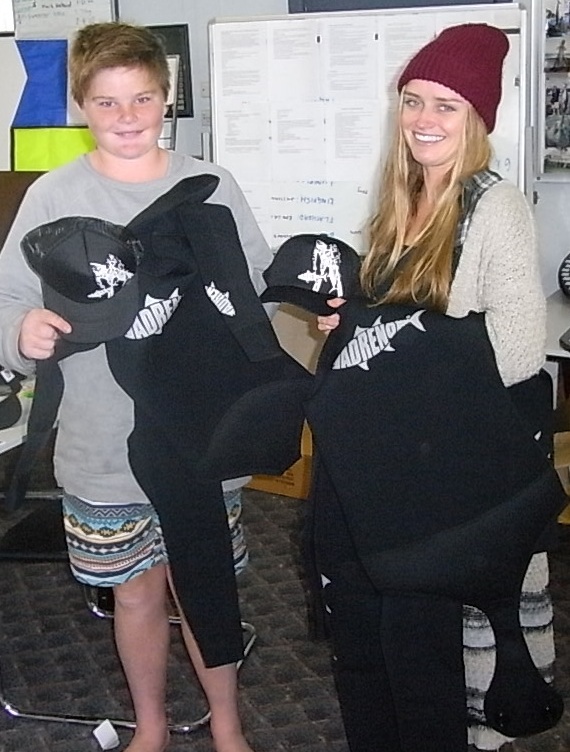 The Junior Champion was Hayden Montgomery and he was stoked to receive the Adreno two piece wetsuit; Ladies Champion, the ever smiling Alyssa Moore graciously received her Adreno Ladies wetsuit prize, her current wetsuit is a thin one piece and you may be able to tell in the photo that Alyssa is half frozen, the Adreno suit which fit her to a T has come at exactly the right time and will be sure to keep her in great comfort for some time. The feedback given to me after the event from the younger spearos and veterans alike was extremely positive, “awesome” and “just awesome” was a just descriptor being bandied around as I asked the guys thoughts of the dive when the phrase “I learnt a lot!” started coming out that’s when I knew the concept will catch on. To top the day off was to see the King of the South Coast, Jack Lavender enjoying himself and talking about the dive so enthusiastically after giving his day to swim around with a relative rookie and show him some skills confirmed to me that all in all spearos are a bunch of great blokes who are willing to put back into the sport that has given them so much. 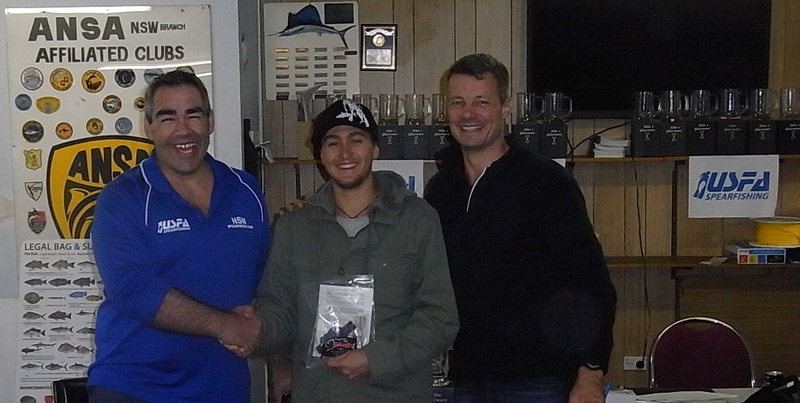 Thanks to the key sponsors Adreno Spearfishing it was so kind of you to donate the amount of prizes you did. 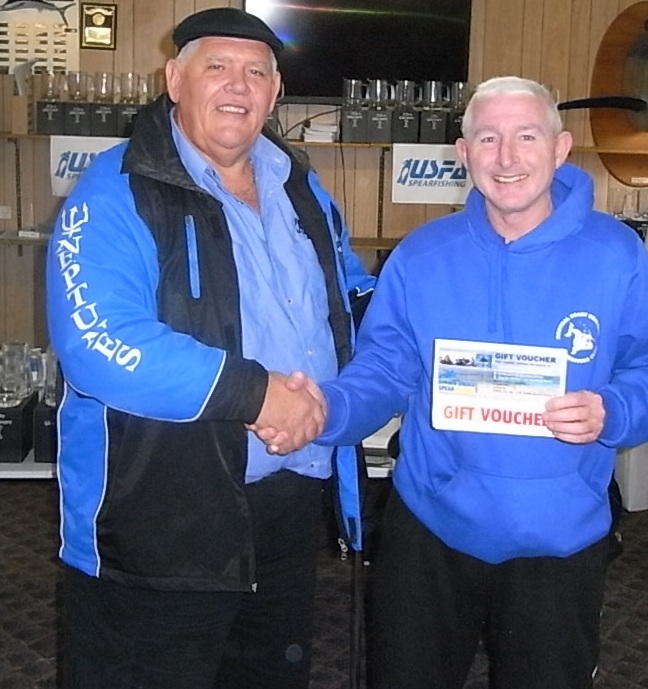 Manny Sub for your awesome roller kit and Down Under Charters for your terrific prize. To the boys that helped out, I think it was everyone who entered the event, cheers and more beers to you all! The pair’s had swum hard, dived well and done it under the eye of an immediate watchful buddy on the surface practising the one up one down style of spearfishing; many tips were passed around and much was learnt. I’ll see you down there, at the next USFA One Up One Down meet.